The September course is the second of three games or courses for the summer series. 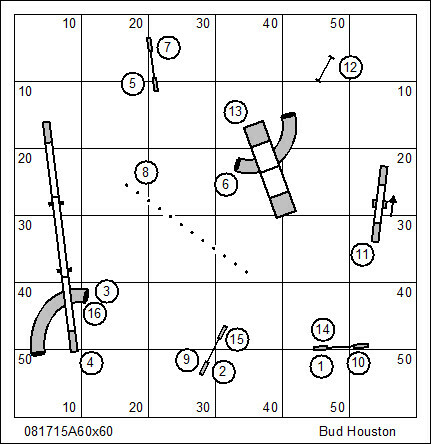 This is a numbered course designed by Wayne Van Deusen. The scoring basis is Time, Plus Faults. Results have been submitted by PAWS – AK (North Pole, Alaska) in the August competition of the summer series. Results have been submitted by B&D Creekside (Latrobe, PA) in the August competition of the summer series. B&D is a new club in the league. While they’ve begun with a small smattering of dogs, this club has the capacity to report about 150 league results each week; and may very well become a formidable competitor in the league. Results have been submitted by K9 Manners & More (Broken Arrow OK) in the August competition of the summer series. K9 Manners continue to grow their league team with something like 70 dogs, and a dozen of them new to league play with this reporting. 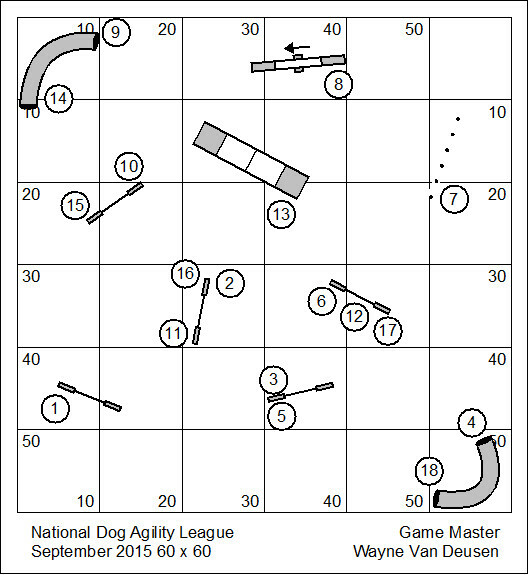 We’re adding pick-up game for National Dog Agility League clubs. Though results will not apply to the League underway, dogs still earn Lifetime Performance Points (LPP). The League has focused on and even specialized in International level skills and challenges. These days aside from the USDAA’s Masters Challenge class (and the new AKC class) we don’t really have the opportunity to hone skills that are common in Europe and are very likely to be featured when we send our World Team to Europe. We’re pleased to welcome Clermont Dog Training Club (near Cincinnati Ohio) and B&D Creekside in Latrobe, Pennsylvania to the National Dog Agility League. There are a couple more clubs which may join us. We’re working to create a coalition of clubs in the Ohio Valley that will get together for an annual championship tournament that owes no affiliation to any big agility organization. They have such a tournament in Florida. Every club sends teams of nine dogs & handlers broken up into 3‑Beginner; 3-Intermediate; and 3-Masters. The winning “team” is the aggregate score. On first look the same-sided spiral looks almost too simple to consider as a game of competition. But in practice the handler needs to understand the subtle handling and movement differences between a tight pinwheel and a big wide open flow of obstacles. 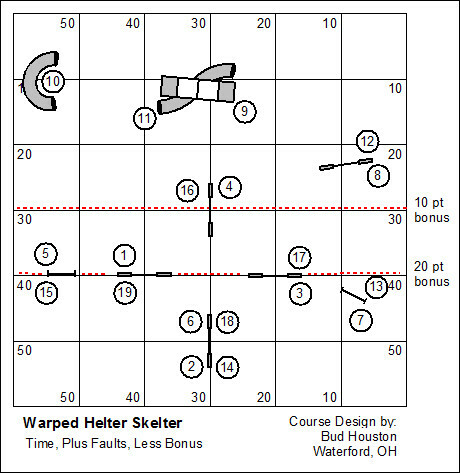 The Helter Skelter will certainly expose small errors in timing and position. This variation of the Helter Skelter is called “there, and back again”. The course starts tight, then opens up; and then turns back on itself on a big sweep and tightens back into the central pinwheel. To enhance the drama of the game this Helter Skelter has a distance challenge that will appeal to the gambler and risk taker. Two containment lines are drawn on the course that will earn the dog a bonus if the handler manages to stay on his side of the line while the dog works…without fault. This is the Time Warp element of the game; and so our variation is called “Warped Helter Skelter”.